Veteran midfielder Barry Robson has been offered a new contract. But defenders Joe Shaughnessy, Clark Robertson and Craig Murray, plus midfielders Kieran Gibbons, Jamie Masson and Andrew Driver are leaving. McManus was voted named League One player of the year after scoring 23 goals on loan to Greenock Morton. 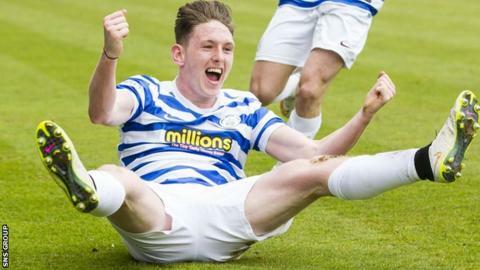 The Greenock club's manager, Jim Duffy, told BBC Scotland that he expects the 20-year-old to join an English club. Dons boss Derek McInnes said: "Declan has decided his future lies elsewhere and we wish him all the best in his future career. "We want to continue to work with players committed to Aberdeen." However, goalkeeper Danny Rogers, who spent the majority of the season on loan at Championship side Dumbarton, has signed a new contract. Defender Donervon Daniels will return to his parent club West Bromwich Albion at the end of his loan. It had already been announced that captain Russell Anderson was retiring and taking up a business development role at Pittodrie. The six players not offered new contracts had only played seven games between them this season. Apart from Driver, the 27-year-old former England Under-21 international who joined in January after leaving Houston Dynamo, all had come through Aberdeen's youth ranks. Murray, 20, spent the second half of the season on loan to Ayr United. while 22-year-old Masson was with League One rivals Brechin City. Defenders Michael Rose and Lukas Culjak, goalkeeper Robbie Mutch and midfielder Craig Storie have signed new contracts after helping Aberdeen lift the Development League trophy. But team-mates Cem Felek, a German defender previously with Bochum, midfielder Ritchie Petrie and striker Michael Jones will be leaving Aberdeen, while midfielder Marcus Campanile has opted to move to America on a football scholarship.